When it comes to shopping for and comparing energy-efficient appliances and home electronics, look for the ENERGY STAR® and EnergyGuide labels. ENERGY STAR labels appear on appliances and home electronics that meet strict energy efficiency criteria established by the U.S. Department of Energy and U.S. Environmental Protection Agency. The ENERGY STAR labeling program includes most home electronics and appliances except for stove ranges and ovens. In late 2009 or early 2010, you can receive rebates to purchase new ENERGY STAR-qualified appliances when you replace your used appliances. The Federal Trade Commission requires EnergyGuide labels on most home appliances (except for stove ranges and ovens), but not home electronics, such as computers, televisions, and home audio equipment. EnergyGuide labels provide an estimate of the product's energy consumption or energy efficiency. They also show the highest and lowest energy consumption or efficiency estimates of similar appliance models. When to turn off your lights? 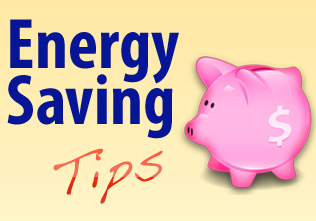 The cost effectiveness of when to turn off lights depends on the type of lights and the price of electricity. The type of light is important for several reasons. All types of lights have a nominal or rated operating life, which is the total number of hours that they will provide a specified level or amount of light. However, the operating life of most types of light bulbs is affected by how many times they are turned on and off. For those bulbs, the more often they are switched on and off, the lower their operating life. The exact number of hours that switching lights on and off reduces the total operating life depends on the type of light and how many times it is switched on and off. Incandescent lights (or bulbs) should be turned off whenever they are not needed. Nearly all types of incandescent light bulbs are fairly inexpensive to produce and are relatively inefficient. Only about 10% of the electricity that incandescent lights consume results in light—the rest is turned into heat. Turning the light(s) off will keep a room cooler, an extra benefit in the summer. Therefore, the value of the energy saved by not having the lights on will be far greater than the cost of having to replace the bulb. The cost effectiveness of turning fluorescent lights off to conserve energy is a bit more complicated. For most areas of the United States, a general rule-of-thumb for when to turn off a fluorescent light is if you leave a room for more than 15 minutes, it is probably more cost effective to turn the light off. Or in other words, if you leave the room for only up to 15 minutes, it will generally be more cost effective to leave the light(s) on. In areas where electric rates are high and/or during peak demand periods, this period may be as low as 5 minutes. Fluorescent lights are more expensive to buy, and their operating life is more affected by the number of times they are switched on and off, relative to incandescent lights. Therefore, it is a cost trade-off between saving energy and money by turning a light off "frequently" and having to replace the bulbs "more" frequently. This is because the reduction in usable lamp life due to frequent on/off switching will probably be greater than the benefit of extending the useful life of the bulb from reduced use. By frequent we mean turning the light off and on many times during the day. It is a popularly held belief that fluorescent lights use "a lot" of energy to get started, and thus it is better not to turn them off for "short" periods. There is an increase in power demand when a light is switched on, and the exact amount of this increase depends on the type of ballast and lamp. The ballast provides an initial high voltage for starting the lamp and regulates the lamp current during operation. There are three basic types of ballasts: magnetic (of which there are energy-efficient and not so energy-efficient types), cathode-disconnect, and electronic. All types can operate two or more lamps simultaneously. There are three main methods that are used in a lamp's ballast to start the lamp: preheat, rapid-start, and instant-start. In any case, the relatively higher "inrush" current required lasts for half a cycle, or 1/120th of a second. The amount of electricity consumed to supply the inrush current is equal to a few seconds or less of normal light operation. Turning off fluorescent lights for more than 5 seconds will save more energy than will be consumed in turning them back on again. Therefore, the real issue is the value of the electricity saved by turning the light off relative to the cost of relamping a fixture. This in turn determines the shortest cost-effective period for turning off a fluorescent light. The value of the energy saved by turning a fluorescent light (or array of lights) off depends on several factors. The price an electric utility charges its customers depends on the customer "classes," which are typically residential, commercial, and industrial. There can be different rate schedules within each class. Some utilities may charge different rates for electricity consumption during different times of the day. It generally costs more for utilities to generate power during certain periods of high demand or consumption, called peaks. Some utilities can charge commercial and industrial customers more per kilowatt-hour (kWh) during peak periods than for consumption off-peak. Some utilities may also charge a base rate for a certain level of consumption and higher rates for increasing blocks of consumption. Often a utility adds miscellaneous service charges, a base charge, and/or taxes per billing period that could be averaged per kWh consumed, if these are not already factored into the rate. The most cost-effective length of time that a light (or array of lights) can be turned off before the value of the savings exceeds the cost of having to replace bulbs (due to their shortened operating life) will depend on the type and model of bulb and ballast. The cost of replacing a bulb (or ballast) depends on the cost of the bulb and the cost of labor to do it. Lighting manufacturers should be able to supply information on the duty cycle of their products. In general, the more energy-efficient a bulb/light is, the longer you can keep a light on before it is cost effective to turn it off. If you live in a newer house, you can probably find out this information from the builder. If you live in an older house, you'll need to inspect the insulation yourself if you don't want an energy assessment. -Inspect and measure the thickness (inches) of any insulation in unfinished basement ceilings and walls, or above crawl spaces. If the crawl space isn't ventilated, it may have insulation in the perimeter wall. If your house is relatively new, it may have been built with insulation outside the basement or foundation walls. If so, the insulation in these spaces won't be visible. The builder or the original homeowner might be able to tell you if exterior insulation was used. -Once you've determined the type of insulation you have in these areas and its thickness (inches), see the U.S. Department of Energy's online Insulation Fact Sheet for how to determine the R-values of insulation previously installed in your home. Solar heat absorbed through windows and roofs can increase your air conditioner use. Incorporating shading concepts into your landscape design can help reduce this solar heat gain, reducing your cooling costs. Shading and evapotranspiration (the process by which a plant actively moves and releases water vapor) from trees can reduce surrounding air temperatures as much as 9° F (5°C). Because cool air settles near the ground, air temperatures directly under trees can be as much as 25°F (14°C) cooler than air temperatures above nearby blacktop. Using shade effectively requires you to know the size, shape, and location of the moving shadow that your shading device casts. Also, homes in cool regions may never overheat and may not require shading. Therefore, you need to know what landscape shading strategies will work best in your regional climate and your microclimate.